Artist Mark Susinno perfectly captures the beauty and wonder of this underwater scene, with the glistening rainbow trout passing by. 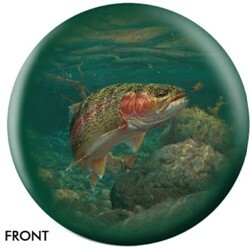 Due to the time it takes to produce the OnTheBallBowling Nature Rainbow Trout ball it will ship in 1-2 weeks. We cannot ship this ball outside the United States.